Our second commission project will have 3 components: a figure kit, a head set & a single head. This poll is for a single head, either for a unique character or a troop builder. The original poll was unclear, so we're recreating the poll with photos so members know what they're voting for. The other heads don't exist yet, so if someone wants to draw a picture of what they're thinking of, I'll link it here. I've selfishly voted for an updated Stalker head. It'd be even better if we could pull off something like the recent 2015 JoeCon Stalker with a removable beret. Then, you could whip a knit cap on him for an '89 look. I'm hoping that the Slayer Cool Breeze sculpt reappears one day, Billy is kinda boring (typical guy with an eyepatch), and the "American Ninja" guys could be a future 2-pack (though no-hat Stalker might fill in for Steve James!). One more thing: I'm assuming all these heads are ball-jointed neck posts. You can usually easily modify a ball joint to fit a swivel neck, but not the opposite. Let me know if I've got that wrong and I'll update the poll ASAP. It's better with pictures, thank you. By the way, I like all of the choices. I had to lay my vote down for Billy. I've waited 20+ years for a Billy figure. He's one of the few Marvel characters without an ARAH incarnation. Time for a Billy! Some of us don't want to order stuff that was already done like the Pythona, Billy, Cool-breeze, etc. because the molds are already out there. Some of us would like to have new stuff done. Few days left for our final decision! Hi Everyone. I'm just new here but have been collecting/customizing RAH figures since the beginning. I have to agree with Rambo in that it would be great to get some RAH offerings that haven't been done before. 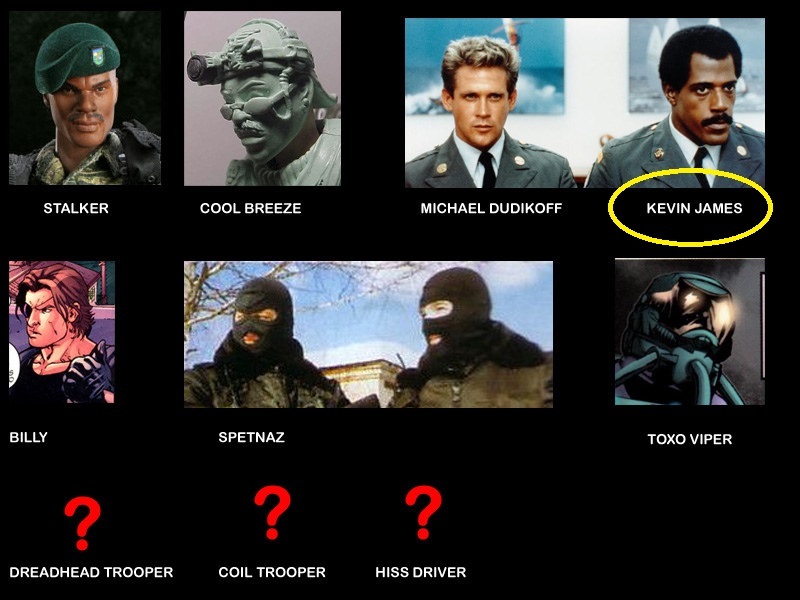 That being said, I guess the Michael Dudikoff as American Ninja head would be a good choice. And the winner is everybody's favorite sergeant who isn't Duke, Stalker! Now that all 3 polls are finished, we should probably iron out the details we want in each. We can just comment in the poll threads. I'd like to see Stalker without a hat, if possible. Maybe whip one of the new Marauder berets on him. Lots of good choices Maybe a 3 pack of unproduced character heads to include any of the following Cool Breeze Billy Rug Rat Helix Heart Wrencher Pythona Etc..